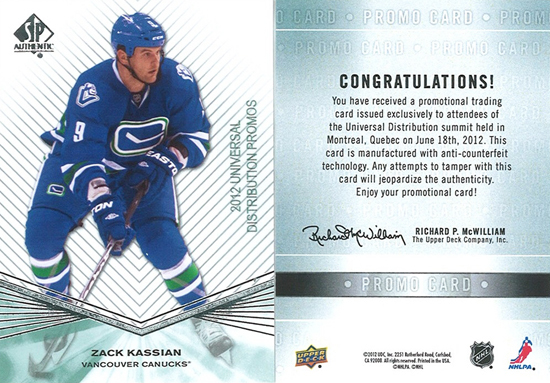 While Upper Deck does not have a finalized arrival date for 2011-12 NHL SP Authentic quite yet, several Upper Deck Certified Diamond Dealers will get their first taste of the product during the Universal Distribution Retail Summit on Monday, June 18. Attendees will receive a black bag containing a pack of special promotional cards for the event. Each pack will contain a selection of four 2011-12 NHL SP Authentic Rookie Extended Series cards along with one Priority Signings autograph card. 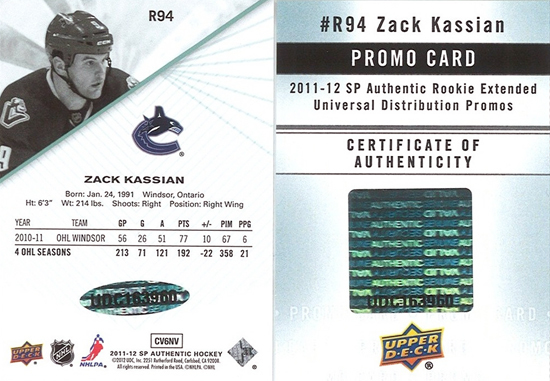 The 2011-12 NHL SP Authentic Rookie Extended Series cards have “2012 UNIVERSAL DISTRIBUTION PROMOS” noted on the right side of the cards and also come with a Certificate of Authenticity to further distinguish them from cards in the currently unreleased set. Given the exclusive nature of this event, these cards should be considered very rare. Expect them to be highly sought after, especially with huge rookie names like Ryan Nugent-Hopkins, Gabriel Landeskog, Adam Henrique, Adam Larsson, Sean Couturier, Mark Scheifele and more included in the set! Upper Deck will be debuting the Rookie Extended Series cards from 2011-12 NHL SP Authentic on June 18 in Montreal with Certified Diamond Dealers. Each card will be stamped on the front and include a certificate of authenticity. What is the holdup on the release? Us as collectors can’t even get an approximate date for the release? This is very very sad. One of the most anticipated products every year, and we get jerked around once again. Hal, it is being held up in order to get more hard-signed autograph content in the product. There is a lot of multi-signed autograph cards included so it is important to us to have as few redemptions as possible in the release. We would rather apologize for the delays, than put it out before it is ready and apologize for all the redemption cards in the product. Thanks for your patience, this release should definitely be worth the wait! Can collectors go to the event in montreal and receive a pack or this event is reserved for dealer ? With multi-signed autograph cards usually at the odds of 1 per case, I don’t see why you’re making such a fuss over so little, should the multi autographs really be the reason for the delays. Doesn’t sound very legitimate to me. Why hold up a product that has had tremendous success (even if there’s redemptions) over the years? Are you just building up the hype or is something wrong? It is just dealers, but many will be sharing these cards with their customers when they get back from the event and they will likely make their way into the market from there. No conspiracy here my friend and certainly nothing wrong, we have just been very outspoken about the fact we do not want to release products any longer with high rates of redemptions. If we can delay a product a month or two and get live autograph rates double digit percentage points higher, we think that is the right thing to do. It leads to a better pack opening experience for our customers and a longer product shelf life for dealers. The product is done, as you can see from these cards, we are just waiting to get more hard-signed autographs in house. It won’t be much longer.